What is Invokana (Canagliflozin) used for? Invokana contains the active ingredient canagliflozin, sodium-glucose cotransporter 2 (SGLT2) inhibitor that can be used alongside diet and exercise to treat type-2 diabetes mellitus in adults. Canagliflozin maintains glycemic controls by decreasing the amount of sugar absorbed by the body and increasing the amount of sugar excreted in the urine. How should I use Invokana (Canagliflozin)? Patients usually begin with a starting Invokana dose of 100mg daily. This should be taken before the first meal of the day. If blood tests show that glycemic control is not being reached with this dosage, a maximum of 300mg daily can be taken. Invokana comes as a 100mg tablet (100mg of canagliflozin per tablet) and is sold as a strip of 10 tablets. Use Invokana as part of a complete diabetic plan including diet and exercise for best results. What are the side effects of Invokana (Canagliflozin)? The most common side effect during clinical studies was genital mycotic infections in female patients (report in approximately 11% of subjects). Genital mycotic infections were also reported in male patients, however they were less common (reported in around 4% of patients). While not reported during clinical studies, there have been subsequent reports of bone fractures and a higher risk of falls during the first few weeks of treatment with canagliflozin. Canagliflozin and the resulting blood sugar levels can cause dizziness, light-headedness or fainting. Make sure you are aware of how these affect you before driving a car or operating machinery. Alcohol has a moderate interaction with canagliflozin and can cause both hypoglycemia and hyperglycemia. 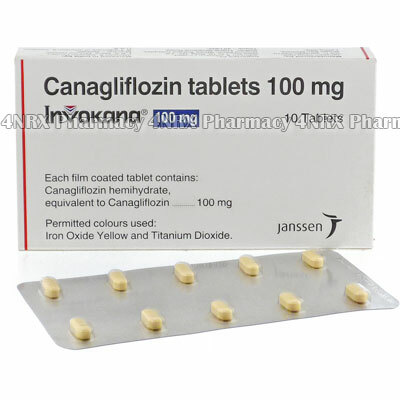 Canagliflozin is a Pregnancy Category C drug and it is not known if canagliflozin is passed through breastmilk. Patients with kidney or liver problems, hypertension (high blood pressure), hypotension (low blood pressure), hypercholestrolemia (high blood cholesterol), or high blood levels of potassium should discuss this with their doctor before using Invokana. Canagliflozin interacts with many different medicines. Tell you doctor of all medicines you are taking including prescription drugs and non-prescription drugs before you begin treatment with canagliflozin.